If you are considering refinancing and/or consolidating your student loans, there are a range of companies that can help you find the best solution for your circumstances. And this is definitely something that everyone who holds student loans should be looking into. After all, by locking in a lower interest rate on your student loans, you can potentially save yourself tens of thousands of dollars and months of repayments. This article is going to provide further information on one of these companies: LendKey. LendKey’s main benefit is the sheer number of lending institutions in its system, providing you access to over 300 community lenders all over the US. It can also save you thousands of dollars by simply filling out one of the shortest forms you’ll ever see. Start the process in only a couple of minutes here or read on for why we strongly recommend that you consider LendKey for your student loan refinancing and consolidation. What does student loan refinancing involve and is it right for me? I would strongly recommend that you first read our article on How to Refinance Your Student Loans in Minutes and Save Thousands. LendKey quickly and simply provides you with access to loan offers from hundreds of lenders throughout the US – for free! It is specifically focussed on credit unions and community banks, so is the ideal option if you are looking to refinance using one of these lenders. This is particularly great when you consider that they often have better interest rates than the bigger banks. In addition, the significant number of lenders in their system will save you from having to seek information from each individual lender. With a couple of clicks, you’ll be presented with a range of loan offers adjusted to your personal circumstances. This means that you won’t have to approach each lender individually. Anything that saves you money AND time is alright by me! As long as you attended one of the 2,200+ eligible schools, you should be able to submit an application. Offers set out a range of information, including the total repayment amount, the annual interest rate, the monthly repayment rate and the term of the loan. LendKey also allows you to refinance both federal and private loans, including consolidating them together. What about the financial benefit to me? LendKey advises that it can provide savings of over $10,000 and a number of reviews online state that people gained far in excess of that. As mentioned, it’s completely free for you to review the offers available on their website and it will not involve any hit to your credit. In addition, the fact that lenders are in direct competition with one another on the same screen can, it has been suggested, work in your favour by providing the most competitive rates. At the time of writing, variable rates start at 2.74% and fixed rates are as low as 3.15%. There are also some additional financial benefits! For example, LendKey has no origination fees. “What’s that?”, I hear you ask. An origination fee is an upfront fee charged by a lender for processing a new loan application. They are a percentage of the total loan and while the amount can vary, in the case of student loans they are typically between 1% and 4.272%. For a $30,000 loan, that fee can be in excess of $1,200. As such, having no origination fee can represent a massive saving. There is also a 0.25% rate reduction when you sign up for automatic ACH payments (although this is subject to the floor rate). In addition, LendKey has a ‘return policy’. This allows you to cancel private student loans within 30 days of disbursement without fees or interest. Recipients of refinance loans don’t miss out either, with the ability to cancel their loans within three days of disbursement under similar terms. That’s a pretty amazing deal. Finally, they have a range of flexible repayment options, including interest-only payments for the first four years. While The Land of Milk and Money is firmly in favour of paying off your debts as quickly and aggressively as possible, this flexible option may actually help you in tackling your debts as a whole. After all, you should always pay off your debt with the highest interest rate first. If you only have to pay interest the first few years on your refinanced student loan, you can use the money you save to pay off the other higher interest debts in the meantime. If LendKey is free, what’s in it for them? It’s true that you don’t pay anything for using LendKey. Instead, the company receives a commission from their lending partners when you take out a loan with them. You should first keep in mind that LendKey is not a lender. It is also not a credit union or community bank like the lenders on which it displays loan information. As such, you are not borrowing money from them – they are simply showing you the available lending options, although they are available to address any of your questions or concerns even once you have started making payments. All that said, LendKey appears to be highly trustworthy. This is certainly an important consideration in light of the personal and basic financial details that you have to share with them when filling in the initial application form. They state that they have served 59,000+ borrowers. In addition, reviews on their website have an average score of 4.6 out of 5. Significantly, the Better Business Bureau gives LendKey an A+. There are eight complaints about LendKey on the Better Business Bureau site. These are, however, over three years, which is pretty good. All of them appear to be related to miscommunications that have all since been resolved. How do I apply to use LendKey? As mentioned above, their application form is amazingly straightforward. For the rest of the process, I’ll let LendKey’s own infographic explain! One great part of the above process that I’d just like to emphasise is the fact that you can send them photos of documents taken on your phone. Not all of us have access to a scanner, so this can make the application process much easier. However, please note as a general rule that you should always read the fine print on any loan offer. You will likely have to click through to a lender’s site to see the full terms and conditions, as they may not be fully displayed on LendKey. LendKey increasingly has some of the best rates on the market with truly great financial benefits for loan recipients. The fact that it’s free is just icing on the cake! There is a real possibility for you to save thousands of dollars. This, in turn can help you avoid months of repayments with the loans that are on offer through them. 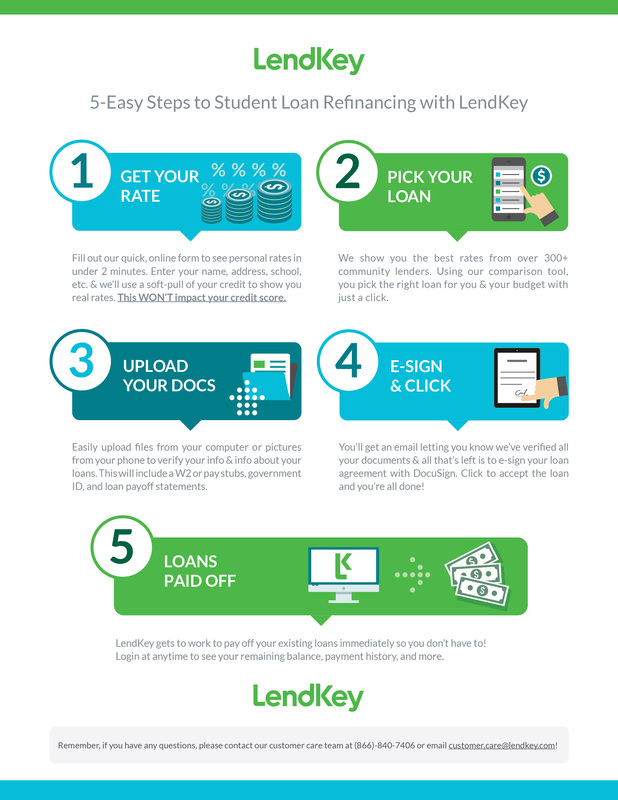 We thoroughly recommend that you consider LendKey for refinancing and consolidating your student loans. You should, however, always check other options to make sure you’re getting the best available deal. However, we’re confident that LendKey may have just what you’re looking for. If you would like to look into a similar website to LendKey, check out our review of Credible.